GREEN GHOST SAYS "I STILL GOTS IT!!!" Marx Green Ghost 3905, 30th Anniversary Edition Released in 1997. 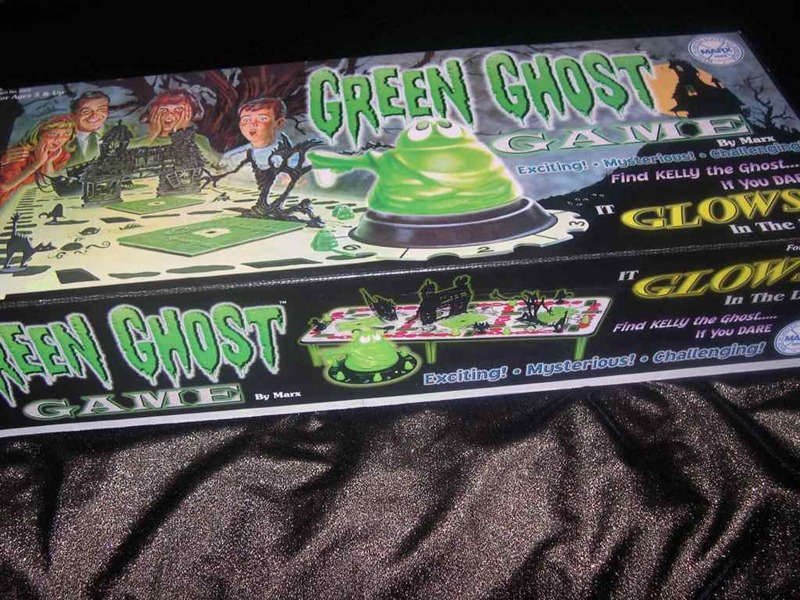 I have just received my first Marx version of the Green Ghost Game. I likes it!!! A lot is different about it, a lot is the same. 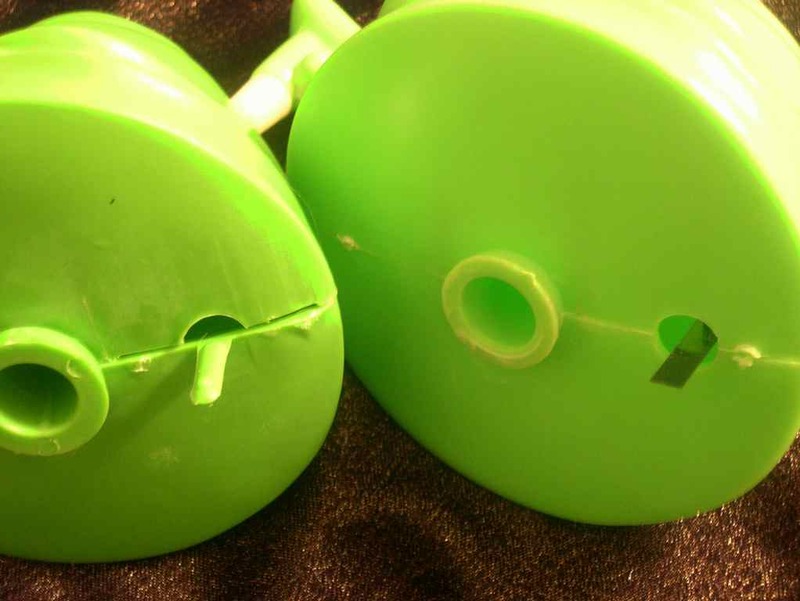 Some parts are sturdier and more durable, others are more prone to break. The box seems sturdier. The front and sides have a glossy litho on them, the back is white cardboard. These boxes probaly wont soil or mildew as easily as their big brother. The back may see some damage if exposed to moisture. I like this box. The graphics are sharp and the colors are strong. Adds to the atmosphere of the game. 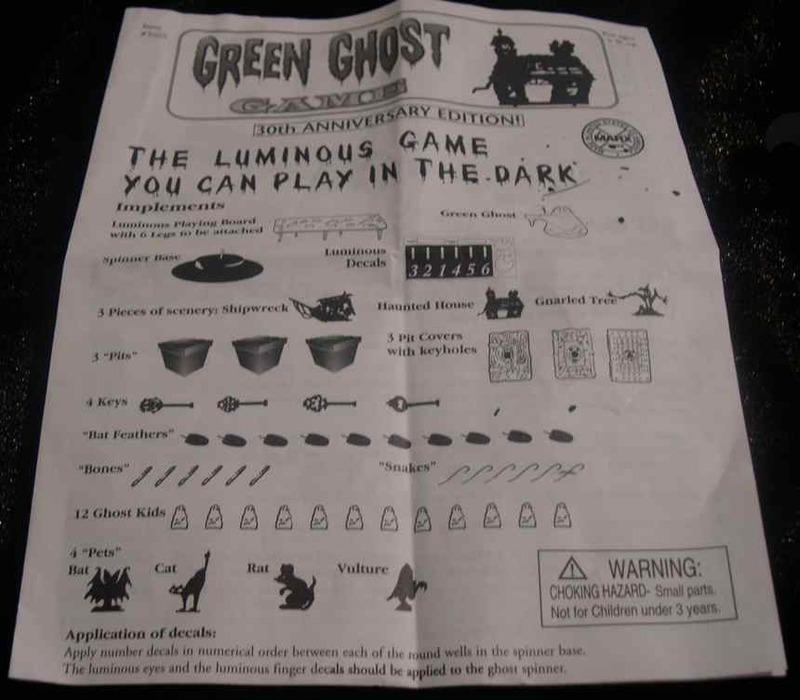 The instructions are much bigger than the original instructions that used to come with the Green Ghost Game. These instructions are the size of typing paper. Noticable differences are the new version of some parts that replaced the out dated ones. Decals replaced plastic pieces for the numbers and dividers on the spinner base. Those old plastic pieces often were lost. 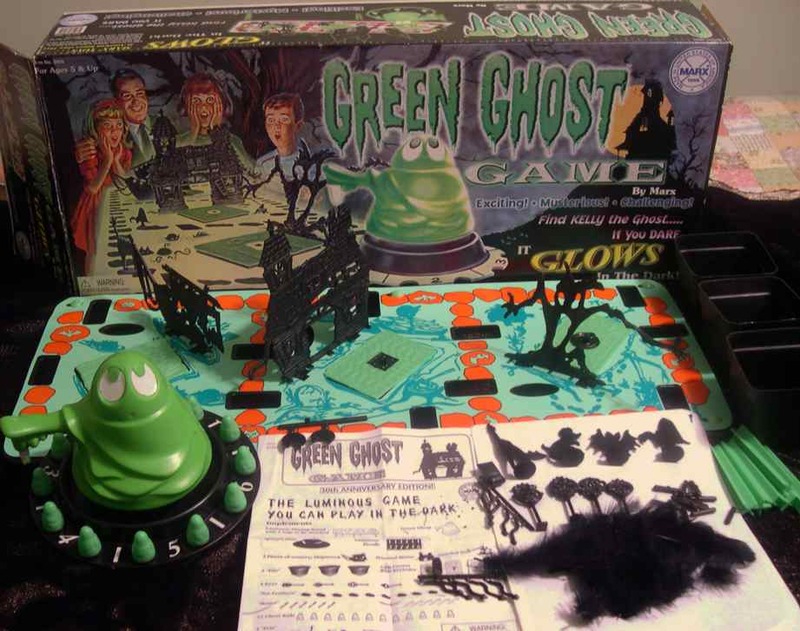 Green Ghosts' glowing parts such as his eyes and finger are also decals. I've noticed 2 different Marx fingers. One is black and one is green. Also I have noticed spare eyes for the ghost that are black, plastic pieces that don't glow. The new large Green Ghost Piece seems to have a tiny mouth. Looks like he's saying "Boo!" 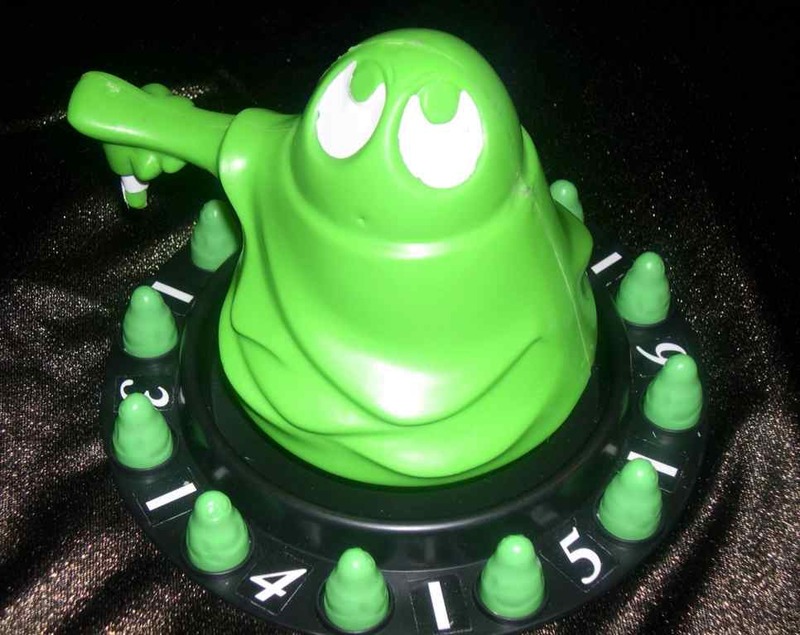 The bottom of the ghosts have a noise maker that clicks against the spinner base to make creepy noises. The Ghost on the right is the old version. The Ghost on the left is the new. The old transogram ghosts had a flexable metal noisemaker that was very efficient. It made the noise yet was durrable. I've never really seen a broken Transogram noise maker. However, the Marx clicker is a made from a piece of plastic that is attatched to the ghost. It's not very durrable. I've received two of these Marx ghosts with broken "thingies". So I would say this part is most prone to break on this version of the game. Plastic snakes replaced the rubber band pieces of the Transogram version. The Marx snakes actually look like snakes but are probably easier to loose than the rubber band pieces. The picture above shows snakes still attatched to the stem. Look they're just babies. 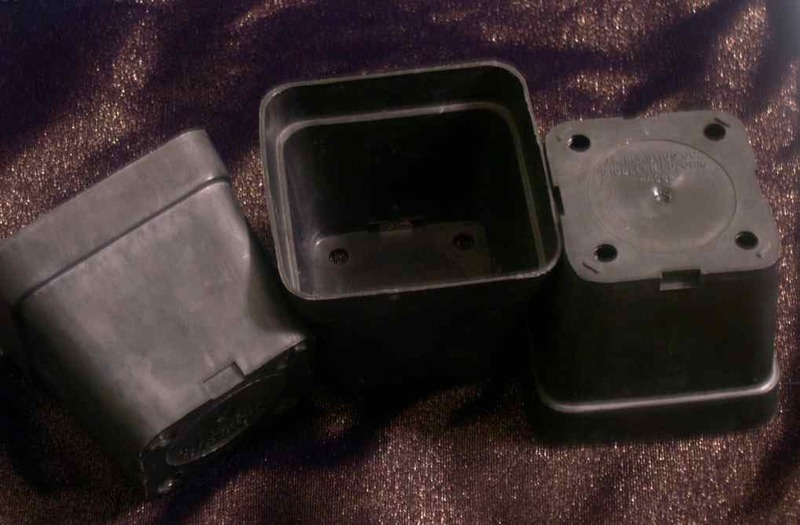 The Transogram white cardboard boxes were replaced by these black plastic pits. I think this is the most resourceful piece of the Marx version. 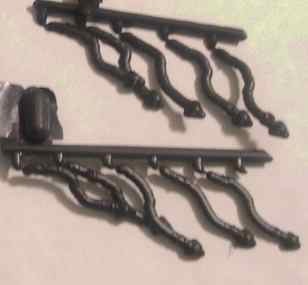 These parts are actually planters. You can even see the drain holes at the bottom. I think this was a good idea. It makes the game look spookier and these parts will last forever. The white cardboard boxes werent too durrable and always seem to have little black feather pieces stuck at the bottom that you can never scrape off. Yuck. I forgot to include a seperate photo of the game board. Scroll to the top of the page and look at it in the first picture. It is made of black plastic. The original Transogram ones were white and they glowed. The Marx version glows from a top paper piece that is fixed on to the board with plastic bolts. I haven't juiced it up yet and turned out the light to see how strongly it glows yet. I like the new board except for the bottom. There are some plastic tabs that stick out and line up with the pits that go under them. These tabs are weak and prone to break. They are really annoying when you are trying to take pieces out of the box and the game board is in the box. The tabs prevent you from reaching down in the box and pulling anything out. They just get in the way and is why they probably get broken.